Play of the Day: Who's Afraid of the Big, Bad Hillary? 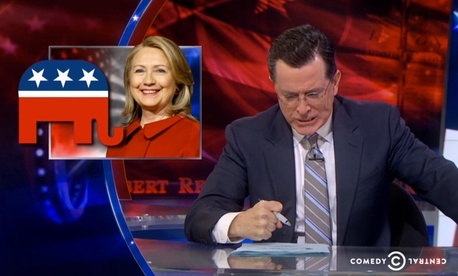 Karl Rove and the Republican Party are not terrified of Hillary Clinton's possible 2016 presidential campaign. If they were scared, late-night host Stephen Colbert wouldn't be laughing so hard. Plus: Joe Biden rejects a prom invitation, and The Colbert Report proves that the Chinese hackers accused of espionage were sneaky geniuses. It is, after all, a difficult task to stop oneself from opening suspicious emails.